1. Which is observed as the National voter's day? 2. Who was the first Chief Election Commissioner of India? 3. Who was the first woman to become the Chief Election Commissioner? 4. Who was the first Keralite to become the Chief Election Commissioner? 5. Which part of the Constitution deals with the Union Public Service Commission? 6. The first Public Service Commission of India was established on____? 7. Which Commission's recommendation in 1924 lead to the formation of the Public Service Commission? 8. Who appoints the Chairman and other memers of the Union Public Service Commission? 9. 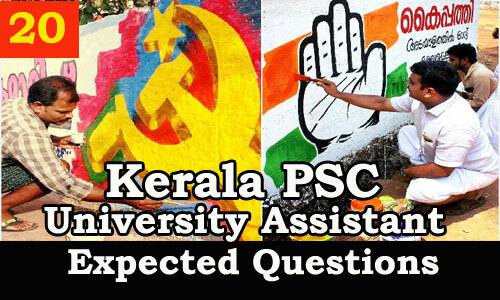 A member of the UPSC holds office for a term of six years or until he attains the age of___? 10. A member of the UPSC may be removed from the office by____? 11. The UPSC submits its annual report to____? 12. Which constitutional body have recently undertaken a project called 'SAMPERA'? 13. Who appoints the Chairman and members of the State Public Service Commission? 14. The Finance Commission of India came into existence in____? 15. Which was the operational period of the first Finance Commission? 16. Who was the chairman of the first Finance Commission? 17. Who appoints the Chairman and members of the Finance Commission? 18. Who was the first Keralite to become member of the Finance Commission of India? 19. Which Finance Commission's operational period was 2010-15? 20. Who was the Chairman of the 13th Finance Commission?